Salmon and Dijon mustard seem to be the perfect taste paring. Combine mustard, maple syrup, paprika, pepper and salt in a small bowl. Place salmon filets on the prepared baking sheet. Spread the mustard mixture evenly on the salmon. Roast until just cooked through, 8 to 12 minutes. 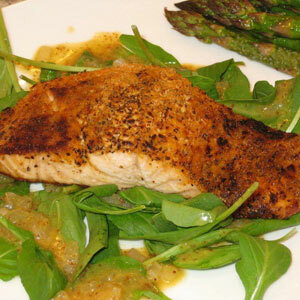 This entry was posted in Entrees, Metabolic Medical Center Recipes, Modified Profast (Fast and Flexible) Recipes, Seafood, Uncategorized and tagged dijon mustard, fish, fresh salmon, healthy, main dish, metabolic diet recipes, salmon, salmon filet, sugar free, sugar-free syrup by foodies4mmc. Bookmark the permalink.